See How This Mom Saved Her Little Boys Life..... With A Camera Phone! Julie Fitzgerald’s life changed in the blink of an eye – literally. 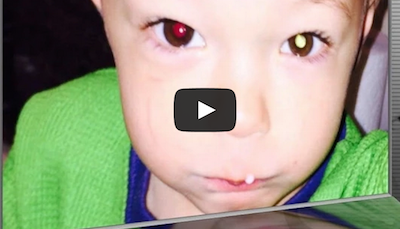 It all began when she noticed a strange spot in her son Avery’s left eye. After coming across an article on Facebook that described white glow versus red eye glow as a sign of potential health risks, she decided to see for herself. After snapping the picture of Avery, there was – the telltale white glow over his left pupil. Within days of taking Avery to the hospital, the Fitzgerald’s suspicions were confirmed. Avery was diagnosed with retinoblastoma, a cancerous disease that covered 75% of his eye. Thankfully, to the mom’s quick actions, Avery is now cancer free. Check out the video below And see how to check your child’s eyes with your camera phone!